"They stick up the Queen Mary in mid-Atlantic!" Dragon’s Domain Records presents the world premiere soundtrack release for ASSAULT ON A QUEEN, featuring music composed by the legendary Duke Ellington for the 1966 adventure/thriller directed by Jack Donohue, written by Jack Finney (INVASION OF THE BODY SNATCHERS), starring the great Frank Sinatra, Vina Lisi, Anthony Franciosa, Richard Conte, Alf Kjellin and Errol John. ASSAULT ON A QUEEN was based on an unlikely story. Treasure hunters discover a sunken German U-Boat, repair it and then use it to rob the Queen Mary in the middle of the Atlantic Ocean. The story was based on a six-part series written by Jack Finney and original serialized in the Saturday Evening Post. Veteran producer Ray Stark bought the rights to the novel in 1960 but shelved it because he didn’t think an audience would buy into the premise. A year later, after a Portuguese cruiser liner was hijacked by terrorists, interest was renewed in the novel. Producer William Goetz at Seven Arts Productions took the project to Paramount Pictures, who agreed to distribute the film. Goetz hired Rod Serling (THE TWILIGHT ZONE) to adapt the novel. Goetz was an old friend of Frank Sinatra’s and was able to convince the Chairman to star in and co-produce the film under Sinatra Enterprises, his own production company. Sinatra was at the height of his popularity in the mid 1960s and his involvement with the project immediately raised interest in ASSAULT ON A QUEEN. It was Sinatra’s idea to hire jazz great Duke Ellington to score the film. Their paths had crossed many times over the years and they had a strong mutual respect. In addition to his strong jazz background, Ellington had also gained some experience scoring films, earning three Grammy awards and an Oscar nomination for his efforts. 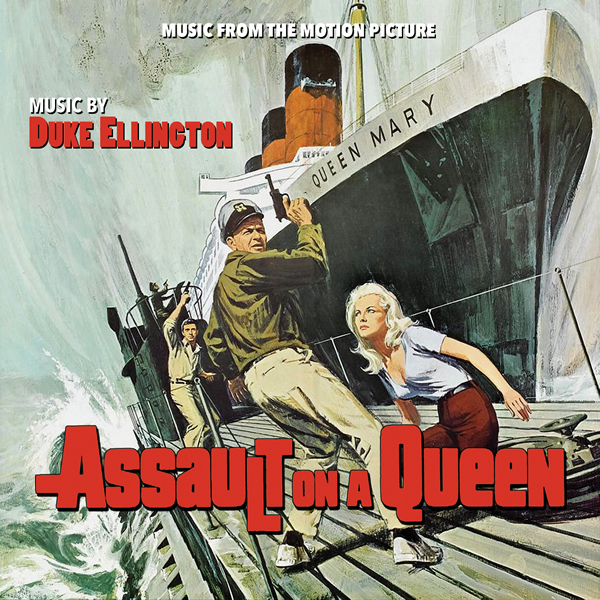 ASSAULT ON A QUEEN was shot in Florida and California in September and October 1965 and Ellington was announced as composer in mid-November. Because of his packed schedule, there was very little time for Ellington to write and record the score. During recording, Ellington had to leave to begin a concert tour overseas and work on the score continued with the participation of Nathan Van Cleave, a veteran composer and orchestrator who had often worked for Paramount, on films such as WHITE CHRISTMAS and ROBINSON CRUSOE ON MARS. In addition arranger-orchestrator Frank Comstock joined the team to assist in the arranging and orchestrating. Ellington did generate a fair amount of material, which he recorded with an 18-piece band, which included some legendary soloists such as Cat Anderson and Cootie Williams, Jimmy Hamilton, Johnny Hodges, Paul Gonsalves and Harry Carney, John Lamb and Louis Bellson, augmented by some of the West Coast's finest jazzmen, including Milt Bernhart , Conte Candoli, along with Buddy Collette and Bud Shank. Five of Ellington's original recordings survived in the final film. The remainder of Ellington's work was adapted by Van Cleave and Comstock for the score as it now exists in the movie. The film's box-office failure, and the fact that so much of the final score was not purely Ellington's work, meant that no soundtrack album was issued in 1966. But Sinatra and Ellington remained friends, and a year later even recorded an album together. Duke Ellington remains one of the most influential figures in jazz, if not in all American music and is widely considered as one of the twentieth century's best known African American personalities. As both a composer and a band leader, Ellington's reputation has increased since his death, with thematic repackagings of his signature music often becoming best-sellers. Posthumous recognition of his work include a special award citation from the Pulitzer Prize Board. Ellington influenced millions of people both around the world and at home. He gave American music its own sound for the first time. In his fifty year career, he played over 20,000 performances in Europe, Latin America, the Middle East as well as Asia. His best known titles include; "It Don't Mean a Thing if It Ain't Got That Swing", "Sophisticated Lady", "Mood Indigo", “Solitude", "In a Mellotone", and "Satin Doll". Ellington's popular compositions set the bar for generations of brilliant jazz, pop, theatre and soundtrack composers to come. Duke Ellington was awarded the Grammy Lifetime Achievement Award in 1966. He was later awarded several other prizes, the Presidential Medal of Freedom in 1969, and the Legion of Honor by France in 1973, the highest civilian honors in each country. Dragon’s Domain Records is excited to bring the premier release of ASSAULT ON A QUEEN to compact disc, featuring exclusive liner notes written by author Jon Burlingame. The music has been mastered by James Nelson at Digital Outland. This premier release of the music from ASSAULT ON A QUEEN satisfies a long-missing entry in Duke Ellington’s discography. Note: The ASSAULT ON A QUEEN score masters sadly are lost to the ages. This release was rescued from the film's monaural music stem. Fluctuating volume levels have been smoothed out, but some hiss is audible, as are occasional low-level sound effects and dialogue bleed from the film's audio masters. All of these have been minimized, with light stereo ambiance added to improve listenability. ASSAULT ON A QUEEN is a limited edition release of 1000 units and is available for immediate shipment.